Are you receiving any of the following errors ? you need to install the "IIS Metabase and IIS6 Configuration Compatibility" feature under Internet Information Services-Web Management Tools-IIS 6 Management Capability to get the IIS6 ADSI provider installed. Your project has been configured to work with IIS. Either you dont have IIS 6 metabase installed or your virtual directory is not configured as a application. To access local IIS Web sites, you must run Visual Studio in the context of an administrator account. If you are recieving any of these errors, you are in the right place to find a solution. Well all of these errors occur because you either might be a newbie IIS 7 + on Windows 7 or Windows Vista ! Let me help you dissolving each of these :) .. Lets start with the simplest one. By default, Windows runs applications in a limited-rights user account even when you are logged on to the computer as an administrator. In Windows 7 or Vista , click Start, click All Programs, and then locate Visual Studio. Right-click Microsoft Visual Studio, and then click Run as administrator. First of all , you should have sufficient administrative access to turn or turn off windows features. 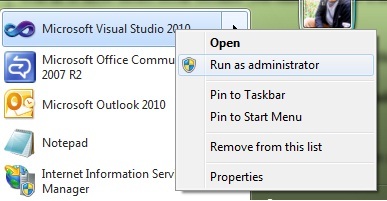 If you have the admin previliges , Please go to control panel in Windows and select Programs as shown in figure below. In the settings page that opens, please select Turn windows features on or off . Expand World Wide Web Services, expand Security, and then select the Windows Authentication check box. To enable Visual Studio to debug applications, you must configure IIS 7.0 with the Windows Authentication module. By default, the module is not configured as part of IIS. Click OK to start the IIS and ASP.NET installation process. If you have resolved the above two, and still get the third error, Your project has been configured to work with IIS. Either you dont have IIS 6 metabase installed or your virtual directory is not configured as a application. This is something very smallish but this is something that IIS 7 + has brought in. Well in IIS 6 its just a virtual directory setup thats enough to run a application. But in IIS 7 , you have to make it as a application as well. 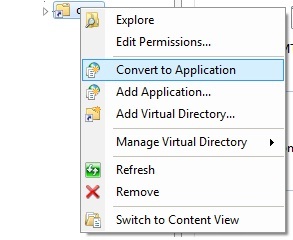 Right click on your virtual directory and click on Convert to Application and you should get rid of this. Thanks, for a newbie, this was so straight forward. My only wish is that those with the know how would approach online help the away that you did in this regard. Thanks a mill.